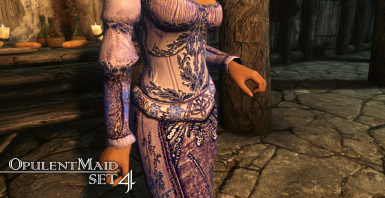 Alternative textures for the Barkeeper and Merchant\'s outfits. Now works with ALL body types. Inspired by many glorious modders. Thank you all. UPDATE (10/5/2013) - Here it is, finally. 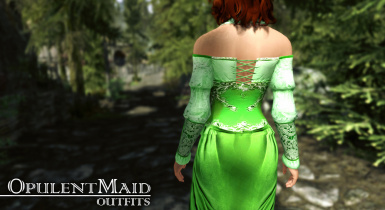 Major updates to all the Maid sets, as well as 2 brand new sets. 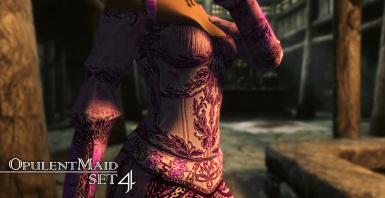 It's worth mentioning here, that I've never really been totally happy with the merchant sets. I may well abandon these and start again from scratch. If it happens, it won't do so for a while though; this mod is being put to rest for a while, so I can work on my other mods. 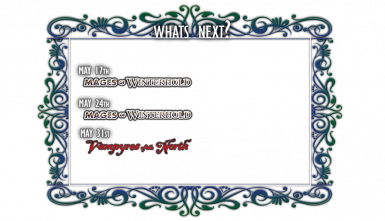 In the meantime however, I do hope you all enjoy what I have created so far. This mod has grown quite unintentionally, into a fairly massive project. 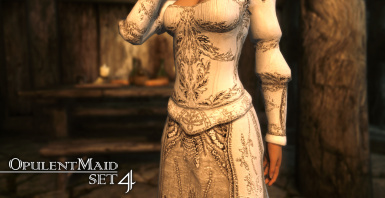 The aim is to provide elaborate and classy outfits for Skyrim. A new update for the Universal edition. Brand new normal maps, and various texture tweaks. Remember, this update NEEDS Version 2. Select NO when updating, and make sure the mod is loaded AFTER Universal V2. 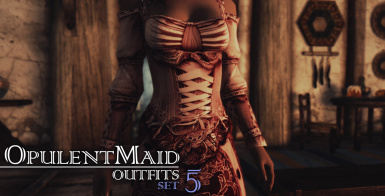 Brand new Opulent Maid Set 2 Dark Edition. 6 Additional, Standalone colors. These items are STANDALONE-ABLE, and forgable under the MISC category. 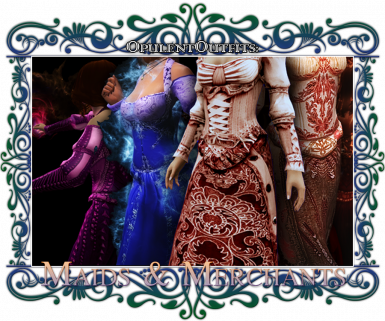 Brand new Opulent Merchant Set 2. 6 Additional, Standalone colors. These items are STANDALONE-ABLE, and forgable under the MISC category. 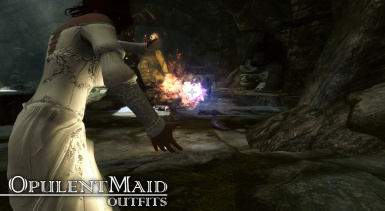 - These mods are compatible with ALL body types. 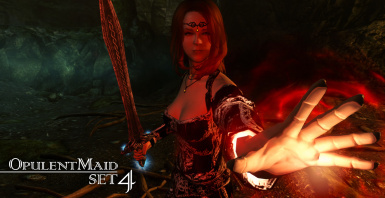 - Each mod is standalone-able. 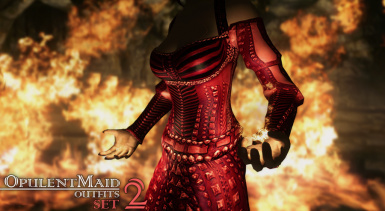 - If you just want your character to have these dresses, then install the 'Universal V2 Edition'. 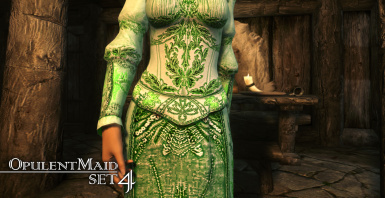 If you want the higher-class/richer NPCs to wear a selection of these, then install the 'Universal Replacers Edition' as well, or on it's own if you just want the NPCs to wear them (you can wear them too in this version. 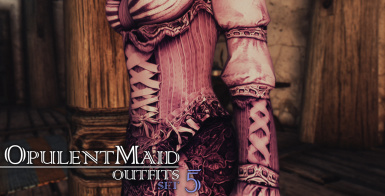 All it does is replace certain vanilla outfits). - If you're installing the new Set 1 Dark Edition over the top of the 'Universal V2 Edition', select NO when updating. - If you're upgrading to the Universal V2 Edition, uninstall any previous versions first to avoid any conflicts. - If you're using the new Universal Replacers Mod, make sure you uninstall any previous versions, and that its loaded last, if you're using other replacer mods. - Clothes are not integrated into leveled lists or shops. This is to avoid conflicts with other mods. - Items can be found under the 'MISC' category of the forge menu. 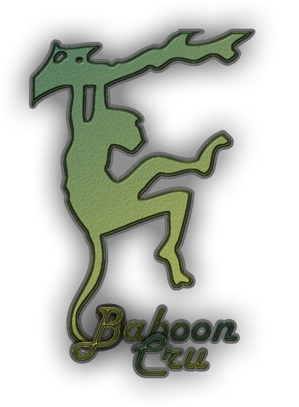 - Please, please report ANY errors or CTD issues. Doing so will help make this mod better. What exactly is this Universal Edition? With special thanks to SydneyB for helping me with this, this version removes the need to supply the meshes, by providing 'Texture Sets' & 'Armor Addon IDs' that clone the meshes used in your game. This means that it is compatible with ANY body type. Could you make higher/lower resolution versions? Sadly, no. Not enough time. I have an Issue with the Universal Edition, could you provide a ... body type edition instead? Sadly, no. Plans for doing adaptations to body types has been abandoned. The reason is that there should be no issues with the Universal Edition at all. It will just conform to whatever body you're using. 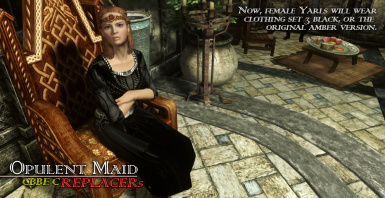 If there are issues, then try uninstalling any previous versions of my mod (if you have any), then make sure you have the correct armor/clothing adapter mod that matches your body type. Because the new mod is universal (see above), the pouches are still present. 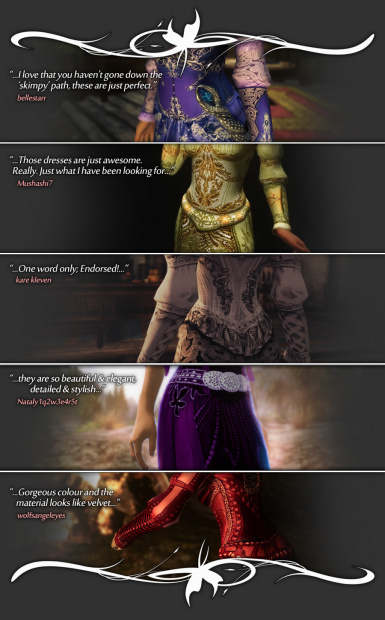 If you dislike them, then use Nifskope to rid them from your Skyrim. It is a fairly easy process, but involves installing 2 free applications. Nifskope & Fallout Mod Manager (or FOMM). 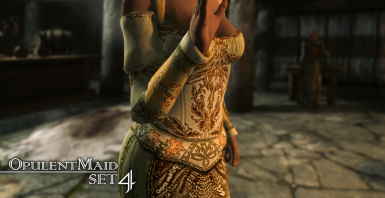 The process is basically, EXTRACT from 'Skyrim - Meshes'.bsm file. LOAD the Nifs into Nifskope, right-click and select Block, Remove. They're just texture sets, so yes. Modification of these mods is not permitted under any circumstances. 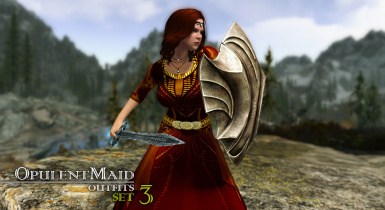 Unauthorized re-uploading of these mods is not permitted under any circumstances. PM me if you have any integration ideas etc. 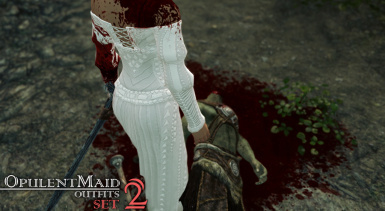 I will be more than happy to cooperate with any modder out there. 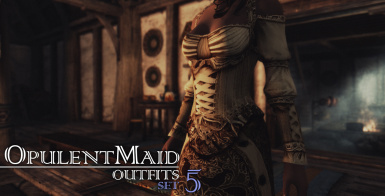 Check out zzJay & GraceDarkling's awesome variations of Opulent Maid Set 4. Click HERE. 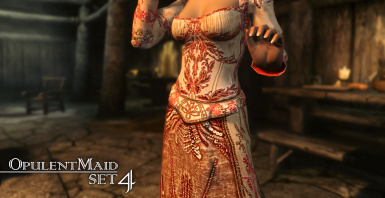 [b]Check out my other retextures: The Mage's of Winterhold. Click HERE. Check out my Opulent Outfits Store. Click HERE.